Morse CE Marked Hydra-Lift Drum Rollers with included Enclosure and Safety Interlock are fully tested and certified compliant with European directives. You set the time to roll a drum from a few seconds to 16 hours to thoroughly mix drum contents, and adjust drum rolling speed from 4 to 16 RPM. 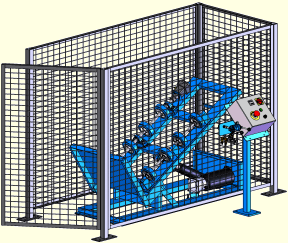 The enclosure has an integrated safety interlock, in accordance with European directives, so the machine automatically shuts off when the door is opened. 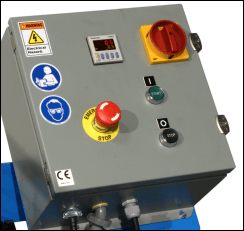 In case of any problem during operation, the tumbler can be interrupted by pressing the red emergency stop knob. Power connections and motor controls must be installed in compliance with applicable local codes. Save Time, Labor and Money! Close the Enclosure to engage interlock. Then tilt over to horizontal drum rolling position. 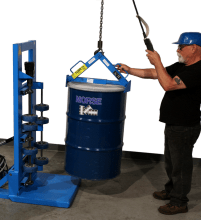 Easy to load a drum with a drum truck (shown left), or with your hoist or crane. 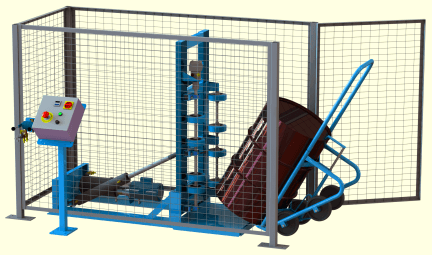 Avoid the hazards of manual drum handling. You can also load an upright drum into the Drum Roller with Morse model 92 Below-Hook Drum Lifter and your hoist or crane (shown right). Use the controls to raise the drum into rolling position, and begin drum rotation. Once mixing is complete, use the controls to return drum to upright position at floor-level for easy handling. 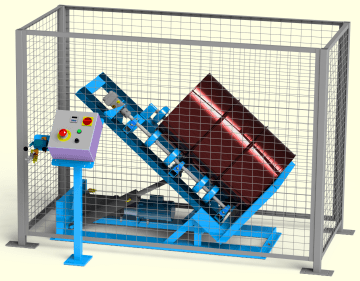 A dry load with violently shifting contents places greater stresses on the machine, and can be harder to roll than a liquid load. 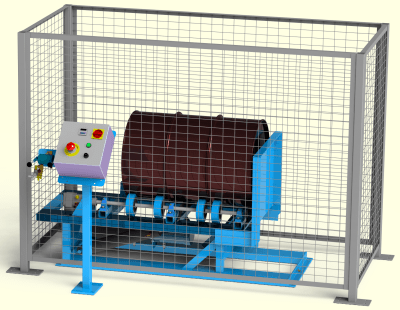 Control Package includes a Control Mast and the appropriate Control Box for each model. Use power controls to start and stop drum tumbling. Install the control station outside the safety enclosure on either side, or at the back of the Drum Roller. 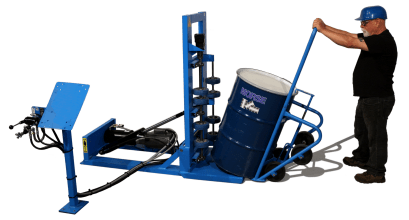 Morse Hydra-Lift 200 Liter Drum Rollers mix drums to thoroughly blend contents right inside a sealed drum. Options for 200 Liter plastic drum roller.